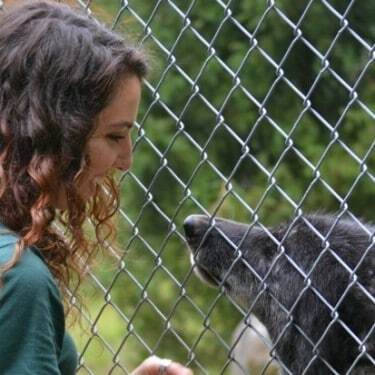 The Wolf Conservation Center is pleased to offer the opportunity for high school and college interns to gain experience in wildlife conservation and education. High school interns will learn about animal husbandry and enrichment; environmental education; enclosure and grounds maintenance; and non-profit fundraising by participating in daily activities alongside WCC staff. Daily activities that interns will assist with include food preparation, helping with on-site education programs, and enclosure construction. The high school internship runs throughout the spring season and is unpaid. Must be at least 16 years of age (driver’s license is encouraged). Must be in good physical condition and able to lift 50 pounds. Preference is given to students pursuing a career in a related field. The WCC offers year-round environmental education and conservation internship opportunities for college students, those who have recently graduated, or others looking to explore a new career path. The internships are designed to expose interns to the field of conservation education and wildlife biology. Interns conduct a variety of educational programs and assist with the daily operations of the WCC, which many vary depending on the internship season. Throughout the course of the internship, interns will primarily deal with the general public but will also have opportunities to interact with camps, scouts, and school groups. Interns will contribute to the success of the WCC through development of special projects, support work, and general maintenance. The WCC does not offer housing for interns. All interns are responsible for securing their own transportation to and from the WCC. Winter/Spring (February-May): This season at the Wolf Conservation Center is very busy with programming, winter weather preparations and spring clean-ups. As an intern during this season you are able to observe the wolves in their full winter coats as they illustrate how animals are able to adapt to their ever-changing landscape. This internship is very flexible to accommodate school, work, and possible weather schedules. The application deadline for this internship is December 1. Summer (June – August): This internship will focus on environmental education, as interns will partake in our summer camp as counselors and educators. There will also be opportunities to assist with general operations such as enclosure upkeep, grounds work, overnight and weekend programming, as well as potential fundraising opportunities. This internship period is very structured and full-time availability is required. Due to the demand of this full time internship there is a stipend for this season. The application deadline for this internship is March 1st. Fall (September– December): As the summer subsides the need for interns does not. Our fall season consists of school programming and winter preparation projects. Interns are able to have a flexible schedule to work around school, life, and other obligations. The application deadline for this internship is July 1st. Applicants are required to be a citizen of the United States. CPR and First Aid certifications are preferred, but not required. Training can be provided if necessary. To apply for our internships please submit a resume, letter of interest and 3 references. Our Internship Coordinator will review all applicants after the deadline has passed. If there are any questions or concerns please contact Reyanne: [email protected].